Whether residential, agricultural or commercial and regardless of size or value, your property deserves the best-selling service to achieve the best outcome. Our estate agency service is tailored to every property and every person. Prior to any instruction, free, no obligation marketing advice in the form of a professional detailed marketing report is provided to every owner. This is a multi-page document which sets out our thoughts on Guide Price and provides a complete breakdown of our costs. 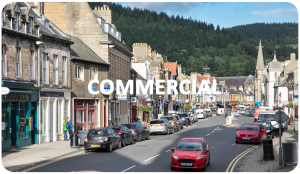 Our high street shop frontage allows us to promote your property from a prime location. Nearly 20% of buyer interest is generated from “walk ins”. All properties are advertised on our website, and our Zoopla, Prime Location, S1 homes and Rightmove memberships ensure the widest advertising coverage nationally and worldwide. We understand the importance of “first impressions” and ensure brochures are produced to the highest standard, engaging a local professional photographer where necessary. We offer honest advice on how to show your house to its best potential. We operate on a no sale / no fee basis with no withdrawal fee and no hidden extras. We offer weekly updates to all clients and all viewings are followed up within 2 working days. Our close working relationship with lawyers allows us to recommend a legal professional to assist you with conveyancing should you require it. We also initiate a home report survey of your property. If you are searching for a property, we offer a “PROPERTY ALERTS” function through this website to ensure that you don’t miss out on any property.